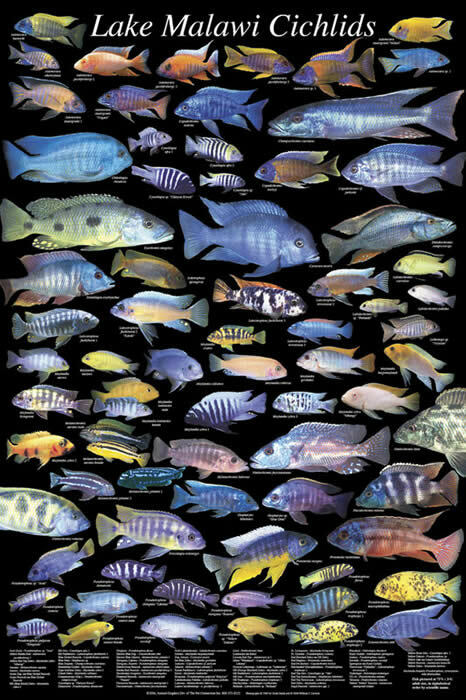 Lake Malawi, in south-eastern Africa, is famous for its large diversity of cichlid fishes. Indeed, it sometimes seems to have more biologists studying these fish than there are actual fish in the lake, even though there are allegedly hundreds of cichlid fish species in that lake. In this sense, it is somewhat similar to Lake Baikal, in southern Siberia, home to the sole species of freshwater seals. 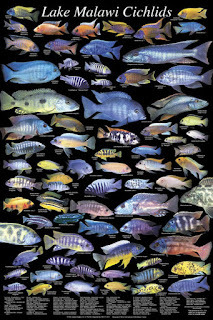 The cichlid biologists are interested in describing the extensive fish diversity, pondering its origin, and thus its contribution to the study of speciation. After all, we are talking about what is usually claimed to be "the most extensive recent vertebrate adaptive radiation". So, we are talking here as much about population genetics as we are about ichthyology. Milan Malinsky, Hannes Svardal, Alexandra M. Tyers, Eric A. Miska, Martin J. Genner, George F. Turner, Richard Durbin (2017) Whole genome sequences of Malawi cichlids reveal multiple radiations interconnected by gene flow. BioRxiv 143859. We characterize [the] genomic diversity by sequencing 134 individuals covering 73 species across all major lineages. Average sequence divergence between species pairs is only 0.1-0.25%. These divergence values overlap diversity within species, with 82% of heterozygosity shared between species. Phylogenetic analyses suggest that diversification initially proceeded by serial branching from a generalist Astatotilapia-like ancestor. However, no single species tree adequately represents all species relationships, with evidence for substantial gene flow at multiple times. The last sentence seems to be somewhat disingenuous. How could a single tree be expected to describe this scale of biodiversity? Any rapid radiation of diversity is unlikely to be completely tree-like. The increase in diversity can be modeled as a tree, sure, but it is very unlikely that there will be instant separation of the taxa, and so the tree model will be ignoring a large part of the evolutionary action. There will, for example, be ongoing introgression between the diverging taxa, as well as hybridization due to incomplete breeding barriers. These avenues for gene flow can best be modeled as a network, not a tree. The issue here is that the authors write the paper solely from the perspective of an expected phylogenetic tree, and then feel compelled to explain why they do not produce such a tree. Indeed, the authors present their paper as a study of "violations of the species tree concept". To obtain a first estimate of between-species relationships we divided the genome into 2543 non-overlapping windows, each comprising 8000 SNPs (average size: 274kb), and constructed a Maximum Likelihood (ML) phylogeny separately for each window, obtaining trees with 2542 different topologies. So, only two sequence blocks produced the same tree, presumably by random chance. An example "tree" for 12 OTUs is shown in the diagram. It superimposes a possible mitochondrial trees on a summary of the "genome tree". The fact that we are using over 25 million variable sites suggests these differences are not due to sampling noise, but reflect conflicting biological signals in the data. For example, gene flow after the initial separation of species can distort the overall phylogeny and lead to intermediate placement of admixed taxa in the tree topology. Note that gene flow is seen to "distort" the phylogeny rather than being an integral part of it. In this case, "phylogeny" apparently refers solely to the diversification part evolutionary history, rather than to the whole history. The ultimate questions from this paper are: "what is a species concept? ", and "what is a species tree?". The authors write a lot about species and trees, and yet their data provide very clear evidence that both "species" and "tree" are very restrictive concepts for studying the cichlids of Lake Malawi. Britta S. Meyer, Michael Matschiner, Walter Salzburger (2017) Disentangling incomplete lineage sorting and introgression to refine species-tree estimates for Lake Tanganyika cichlid fishes. Systematic Biology 66: 531-550. Because of the rapid lineage formation in these groups, and occasional gene flow between the participating species, it is often difficult to reconstruct the phylogenetic history of species that underwent an adaptive radiation. In this study, we present a novel approach for species-tree estimation in rapidly diversifying lineages, where introgression is known to occur, and apply it to a multimarker data set containing up to 16 specimens per species for a set of 45 species of East African cichlid fishes (522 individuals in total), with a main focus on the cichlid species flock of Lake Tanganyika. We first identified, using age distributions of most recent common ancestors in individual gene trees, those lineages in our data set that show strong signatures of past introgression ... We then applied the multispecies coalescent model to estimate the species tree of Lake Tanganyika cichlids, but excluded the lineages involved in these introgression events, as the multispecies coalescent model does not incorporate introgression. This resulted in a robust species tree. Once again, phylogeny = species tree.